On April 12, at 22:42 an emergency call was received to “911” service that а car accident had occurred near Vanatur block in Hrazdan town, Kotayk Province: smoke was noticed in a car and there was a casualty. The rescuers’ help was needed. 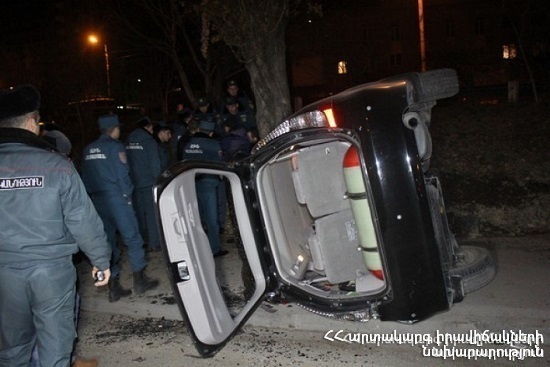 It turned out that “Mercedes C180” car (driver A. P. born in 1980) had crashed into a fence and turned over at 54 Mkrtchyan street in Tsaghkadzor town. The rescuers disconnected the automotive battery of the car, put the car back onto its wheels and loaded it to a tow truck, took cleaning up actions of the roadway.